"(Don't Fear) The Reaper / Tattoo Vampire"
"Debbie Denise / This Ain't the Summer of Love"
"Agents of Fortune" is the fourth studio album by American hard rock band Blue Öyster Cult, originally released in a gatefold sleeve LP in 1976 through Columbia Records in the United States, and CBS in the UK. The platinum-selling album peaked at No. 29 on Billboard's Pop Albums chart, while the single "(Don't Fear) The Reaper" peaked at No. 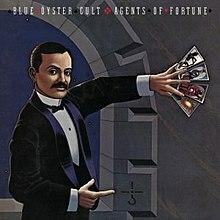 12 on the Pop Singles chart, making it Blue Öyster Cult's biggest hit. The band also became a larger concert attraction at this time—largely based on not only their stageshow, but aided by the airplay of "(Don't Fear) The Reaper," which to this day is a staple of FM rock station playlists. Concert venues became larger, the show became more intricate and BÖC was reaching its commercial peak on the tour circuit. Patti Smith – vocals on "The Revenge of Vera Gemini"
Album produced by Murray Krugman, Sandy Pearlman and David Lucas. The albums hinged cover is in excellent condition, displaying only minimal signs of wear.